Happy New Year Everyone! Well, another year and a few other projects have been crossed off our list. There is something satisfying about crossing tasks off my never ending to-do lists. I started creating a "Home project goals list" a few years ago and it has really helped keep us on track. Of course these are not the only things we will be working on this year. I am always crafting up smaller side projects. Come check out our accomplishments from 2017 and see our new 2018 project goals! Our Christmas elf has made her appearance this Christmas season. Come check out the mischief our little elf has gotten herself into! Meet the Flintstones! Dressing up in family costumes can be fun, but can also be pricey! Come check out my tutorial on how I made our family Halloween costumes based on the classic animated sitcom "The Flintstones." Birthday garland is so easy to make and personalize to any special occasion! Check out my "Oh, Two-dles" themed birthday garland and get my Cricut Design file to create this unique piece yourself! An "Oh, Two-dles" birthday party would not be complete without a "Happy Birthday" banner inspired by Mickey Mouse. I have created a tutorial on how to make this banner and also provided you my Cricut Design file. Your Mickey Mouse themed party is not complete without it! We enjoy horror movies so much that we need a calendar to schedule them out for the month of October. Looking for some fun activities to do in the fall? Check out my Free Printable Fall fun list! Your party is not complete without a "Welcome to the party" door sign. Come check out my "Oh, two-dles inspired door sign for my Daughter's 2nd Birthday! I think we have impressed ourselves with our woodworking skills. 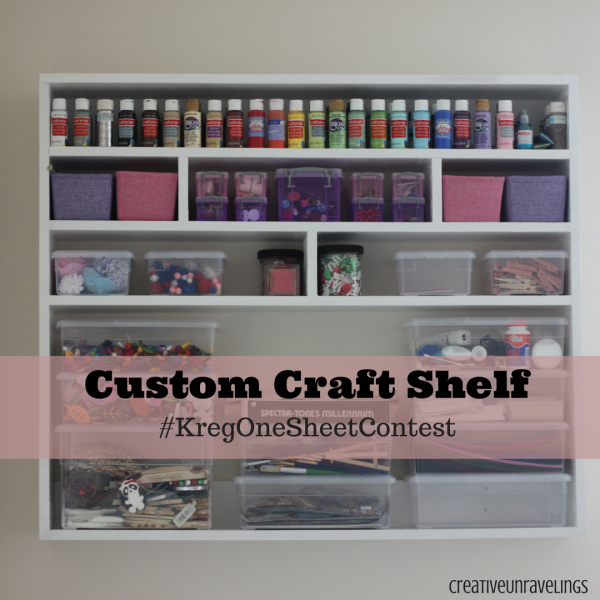 So when I heard that Kreg was hosting a contest I knew we should try and give it a shot! The rules are simple, one sheet of plywood and hardware and finishing supplies are allowed. The prize is Kreg tools and we could always use more tools! This should be nothing compared to the Custom Built-in we made for our Bonus Room or what about our Custom Pantry? We got this!